Lots of people put fluffy, inspirational books on their list of Books That Will Change Your Life but there is none of that going on here. 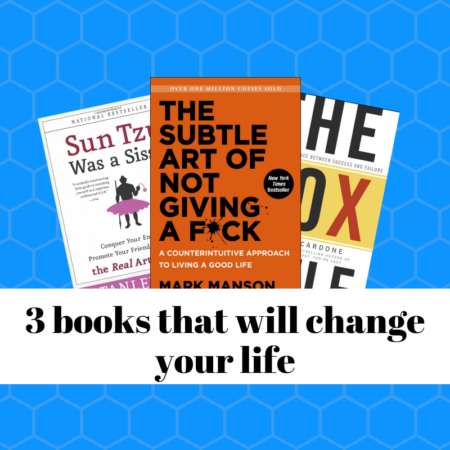 My list of three must-read books for a better life is very straightforward. These three books, if you take them to heart, will make a big shift in your life. I’ve read all three of these, and here is what I think you will get out of each one. In my estimation, the mindset that you get out of this book will change your look at life. In essence, the core of this book is to stop and assess what you are caring about. We tend to care way too much about things that don’t matter. What you think people at the office think about you. How many likes your last post got. Whether or not someone responded exactly how you wanted. Do these things really matter? Read this book and then really assess what you should be giving a f*ck about. I’ll be straight up and say that I’m not a fan of Grant Cardone’s personality, but I have to say that a lot of his content is good. Not always the most polished, but solid in the content. A self-made millionaire and consummate salesman, he is slick and knows what it takes to get ahead. The essential take away from this book is that whatever you are planning, expect ten times the effort to make it happen. Ten times the money. Ten times as long. If you plan for that, then your likelihood of success goes up markedly. This is not generally on people’s must-read list, but it is a game changer. Stanley Bing is a Fortune magazine columnist that has written several books. In addition to this book, it might be worth taking a look at What Would Machiavelli Do? as well. The reason I suggest this one is that it gives you a strategy to live life. What he has done is take The Art of War and port it into real life. Which is also an excellent book to read. The big take away here is to approach life a bit more like a battle with you as the general. This requires a bit of a mental shift and a different frame of reference. You will need allies, loyal troops, and even spies. You can’t win the war solo. Read this, review your battle plans for life and then go to war! There you have my three books that will change your life. I’m a big fan of audiobooks as it makes it very easy to get through them while driving. I highly suggest that you pick up these three books and read or listen to them. If you put the principles in them into practice, you will see some dramatic changes in your life. Have you read any of these? What do you think? Leave a comment and be sure to share with friends that could use this information.